The ATAA is a not-for-profit association of both professional and non-professional financial market traders and investors who are interested in the effective use of Technical Analysis. The ATAA sets out to provide broad education and networking opportunities for all ATAA members. Our offerings change from time to time, depending on the interests of our members and the availability of volunteers to manage events. For an annual fee that is insignificant to most serious traders, there is a wealth of learning opportunities as set out below. That learning is often surpassed by the information shared when networking with fellow members and guest speakers in an environment not available to technical analysts anywhere else in the country. 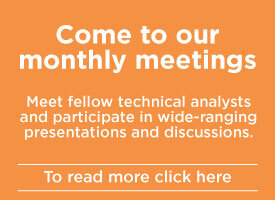 Monthly meetings are held in Adelaide, Brisbane, Canberra, Newcastle, Melbourne, Perth and Sydney. In addition there is a Remote Chapter meeting held "Online". These meetings provide an excellent opportunity to network and socialise with other traders in your local area. Each meeting includes a presentation by one or more industry-recognised speakers, and all meetings are free for Full Members. Check the "Events" website menu for details of both next meetings and past meetings in your area. From time to time, additional meetings are held when an overseas or otherwise exceptional speaker can be secured. For overseas members and members not geographically close to Chapter cities, a remote membership is available at a discount. This entitles members to participate in a growing number of online activities and full use of all of the ATAA resources except meetings. In addition to the monthly meetings, a variety of functions and events is held in different Chapters. These change and evolve over time or may be initiatives being piloted. All offer a degree of knowledge enhancement and sharing and networking opportunities. Many members form subgroups for a variety of such purposes. Members in some locations have formed SIGs to explore particular Technical Analysis topics in depth. Check out the SIGs entry in the "Events" website menu. An ATAA member may study the IFTA CFTe curriculum via self-study and then sit the IFTA examinations. A Masters level program is also available via the IFTA MFTA program. A Monthly Newsletter is sent out via email to all members and registered visitors. The Newsletter typically contains technical articles of interest to traders and investors as well as general news of interest to ATAA members. Members have access to the ATAA website which features educational resources including numerous presentation slides from ATAA meetings, videos and a large document library containing hundreds of articles covering a wide range of topics related to trading and investing in the financial markets. Topics include trading strategies, risk management, market psychology and others. A search facility enables members to quickly locate articles based on "tags", contributor or accession date. Some ATAA Conference presentations and videos are reserved for members who attended the particular conference. ATAA members who develop their skills and make a technical contribution to the benefit of the association may participate in the Fellowship program. Members awarded the designation of "Fellow" are listed on the website. Members of the ATAA who hold Dip TA (ATAA), CFTe and/or MFTA qualifications are listed on the website. Senior members of the ATAA regularly contribute website "blog" articles on a wide variety of subjects. Members may participate in an active "Forum" where they can seek advice, discuss issues on a wide range of topics and generally network with other members. The forum is moderated and is only available to ATAA members. Members in Australia and New Zealand may borrow titles from the ATAA video library, which contains many educational videos. The video library is free to members. DVDs are posted to members and members post them back. DVDs are ordered from the website. The ATAA hosts an annual three-day conference in a major Australian city (in rotation) to allow traders from around the country to meet and hear selected industry experts from Australia and around the world speak on a variety of trading-related topics. This is a major educational event for traders and investors and a great opportunity to meet other technical analysts from around the country and around the world. 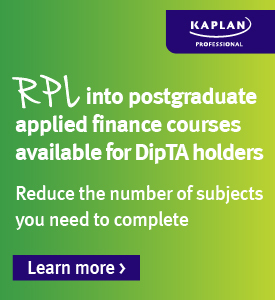 Members receive discounts on a range of products and services related to the financial markets. This includes books, videos, software etc. An extensive list of useful web links is maintained on the website. This is particularly useful to the new member who wishes to build a base of knowledge. The ATAA is affiliated with the International Federation of Technical Analysts (IFTA), which helps members keep abreast of international markets and techniques. All ATAA members are therefore colleagues of IFTA and are entitled to copies of IFTA webinars, the annual IFTA Journal and to attend the annual IFTA conference at reduced rates. 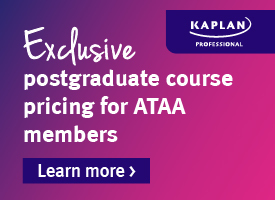 ATAA members are also eligible to enrol in IFTA's education program, which provides two internationally-recognised qualifications in technical analysis. The ATAA offers many Membership options; also a "no-cost" Registered Visitor status. In addition to Full Membership, there are discounts offered to Partners of Full Members and to Students. For those who cannot attend meetings, there are categories for Distance, Overseas and Emeritus Members; for Members in these categories, if meeting attendance is occasionally possible, a meeting fee is payable. Full ATAA Membership may be paid monthly or quarterly via PayPal or on an annual basis via Bank transfer, Credit Card or Cheque.